The stage is set for an epic contest between the opposition Peoples Democratic Party (PDP) and the All Progressives Congress ( APC) . 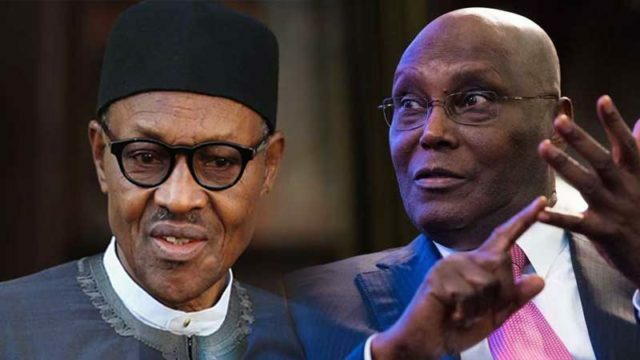 On Saturday, the PDP presidential candidate , Atiku Abubakar will be squaring up against President Muhammadu Buhari, who is the APC candidate in presidential election. In the run-up to the February 16 poll , both parties have been strategising on how to gain victory in the contest, which analysts say is akin to a return leg in a football game. The APC had defeated the PDP in the 2015 general elections, winning the presidential election, a majority in both chambers of the National Assembly, as well as more governorship and state assembly seats . In the aftermath of the 2015 polls, the PDP returned to the drawing board to restrategise on how to regain power at the center and took deliberate steps to prepare itself for the 2019 general elections. An old war horse, Atiku since his emergence as the PDP candidate has been transversing the length and breadth of the country to sell himself to the electorate. Speaking at a town meeting in Abuja recently, Atiku said he is best suited to lead the country at this time, owing to his experience, adding that Buhari has failed to deliver on his promises. The former Vice President noted that at the inception of the present administration, the security challenge in the country was restricted to the Northeast, but has not spread to other geopolitical zones, while the economy is currently in shambles. “I would like to claim that, as far as experience is concerned, I am the most experienced. Secondly, I am bringing my business experience, which I acquired over a long period, almost two decades after leaving public service. “Thirdly, I believe that I am a candidate for the future because I try to bridge the current generation and the future generation,” the PDP candidate said. The PDP national publicity secretary, Kola Ologbondiyan, told Sunday Sun that having addressed the issues that led to its humiliating defeat in the 2015 polls, the party is poised to take on President Buhari and the APC in next weekend’s presidential poll and defeat them. Ologhondiyan noted that the PDP has become the party of choice for Nigerians , once again, judging from the massive support it has received from across the countty since the campaigns began. “By and large , we have learnt from our mistakes. Like they say in my village ,Kabba, Kogi State, when a child falls he looks forward, but when an elder falls, he looks at the situation that gave him a trip; we have looked at the situation that gave the party a trip and we realized that we need to work more with the people and we are working with the people. And the people are rallying with our party and also rallying with our candidate, the people’s candidate, former Vice President Atiku Abubakar,” Ologbondiyan stated. He explained that after that the opposition party apologized to Nigerians for its mistakes that gave rise to the APC administration in the country, it promised to entrench internal democracy in the nomination of its candidates for election, a promise, which it has kept. According to him,”If you remember on 2014/2015, one of the things that cost us the presidency was the manner in which our national convention was conducted. Former Minister of Transport, Chief Ebenezer Babatope concurs. He said the opposition party has prepared very well for the presidential. He dismissed talks that the APC will win the Southwest as mere propaganda. The former minister stated that like other parts of the country, the Yoruba nation will vote for the PDP. “We are very well prepared. Don’t mind what the APC are taking about, the PDP will win.The Yoruba will not go with the APC because the Yoruba have experienced the worst kind of governance in many years . Buhari’s government, apart from being authoritarian and dictatorial has produced nothing for the people who are dying of hunger and starvation. Nigerians are feed up and will give vent to their opinion when we get to the polls,”Babatope said. Recall that as part of its rapprochement with Nigerians, the opposition party through its national chairman, Uche Secondus, in March last year, tendered a public apology to the country for its past mistakes and promised to turn a new leaf. Apart from conducting a rancour-free national convention, which produced Atiku as its presidential candidate , the PDP had successfully rallied 61 other political parties to form a grand coalition against the APC. The coalition christened Coalition of United Political Parties (CUPP) later adopted Atiku as its joint presidential candidate. Analysts say the successful conduct of its presidential primary is one of the key factors working in favour of the PDP in the run-up to the presidential contest. Besides, the successful conduct of the PDP convention, pundits say all the factors that worked against the opposition party in the 2015 polls are seemingly working in its favour in the forth coming polls. Prior to the 2015 general elections, some leaders of the PDP had dumped the party for the APC. Among these leaders are Atiku, Senate President Bukola Saraki , former governor of Kano State, Rabiu Kwankwaso, among others. Also, months before the election, former President Olusegun Obasanjo had fallen out with the party. The exit of Atiku ,Saraki and Kwankwaso from the PDP, as well as Obasanjo’s estrangement from the party, had strengthened the hands of the APC in the 2015 contest resulting in the defeat of the PDP. Today, the table has turned. Late last year, the Senate President and the former Kano State governor, as well as the Sokoto State governor, Aminu Tambuwal , all of whom delivered the states to APC in the last general elections, are back to the PDP. Obasanjo has also resolved his differences with the party. Penultimate week, the leaders Ohanaeze Ndigbo, the Afenifere , the Northern Elders Forum((NEF) Middle Belt Forum (MBF),and Pan Niger Delta Forum (PANDEF) jointly endorsed Atiku as its choice candidate for the 2019 presidential contest, a development which has elicited jubilation among the supporters of the opposition party. In a communique issued in Abuja , the leaders of the group had stated that “we adopt the candidate of the PDP, Atiku Abubakar, of the Peoples Democratic Party (PDP) as the consensus candidate for the office of President of the Federal Republic of Nigeria as he has demonstrated the deep understanding of the critical need of the country at this time and possesses the capacity to proffer clear solutions in that respect. Earlier, Obasanjo had endorsed the PDP candidate and has since been mobilizing support for him. The former president has always played decisive roles in presidential elections in the country since his exit from office in 2007. Ironically, both Obasanjo and some of the socio-cultural groups had supported Buhari in 2015. Ologbondiyan said “ the endorsement is the position of majority of Nigerians and they have come to the end of the Buhari Presidency. And they have seen that another four years under President Buhari can only sink us further into the abyss. And Nigerians have suffered enough in the last three and half years. During the 2015 campaigns, the APC had promised to create three million jobs yearly, fight corruption and secure the country. A promise the opposition and critical stakeholders said the government has not been able to keep. The opposition spokesman told Sunday Sun that the inability of the APC administration to keep its campaign promises to Nigerians gives the opposition more confidence that the president would be defeated at the polls, noting that there is already a consensus among Nigerians that another four years for President Buhari will not be in the interest of the country. The Co- chairman of the Red Card Movement, a civil society organisation, Tony Akabuno agreed with him. Akabuno told Sunday Sun that Nigerians are disappointed in the President Buhari administration and have resolved that he must be voted out in the February 16 presidential election. He explained that since it was obvious that only the PDP candidate stands the chance of defeating the President at the poll, the group has decided to mobilise support for the opposition party. “The government in power from every empirical evidence has not performed very well. That is not just rethoric. People are tired. This government has failed. And they must go. Our primary objective is that Buhari must go. And who can take him out? . It is actually the opposition party that has the capacity to dislodge the sitting president. They are the ones that has the network to be able to dislodge the president . We have profiled all the candidates and Atiku Abubaka has a good team,” Akabuno stated. The CUPP spokesman Ugochinyere Ikenga told Sunday Sun that with the massive support Atiku enjoys from the electorate the opposition is fully prepared to sack President Buhari from the Presidential Villa. He said the APC’s greatest challenges was that they have lost all their support base. “ If it is about election, the opposition has already won President Buhari . How does a President Buhari that is unfit think that he can win an election. Even in the North, they know that President Buhari is unfit and that a vote for him might be a vote for Tinubu and Osinbajo.